Buried beneath the exuberant excesses of the most infamous 24-hour party town on the planet lies a second, semi-secret city with hundreds (if not thousands) of full-time inhabitants. Its shadow population occupy spaces in the over 200 miles of infrastructural support and storm drains – all constructed to support the over-the-top luxury resort and casino complex on the surface above. 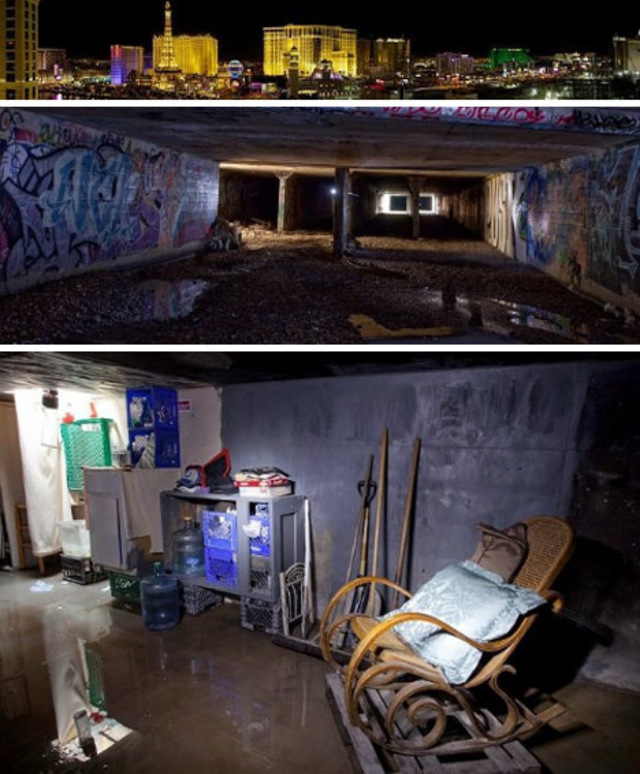 This is the flip-side of Sin City (photographed by Austin Hargrave) you will not see on the casino-sponsored maps or in the company of smiling tour guides. 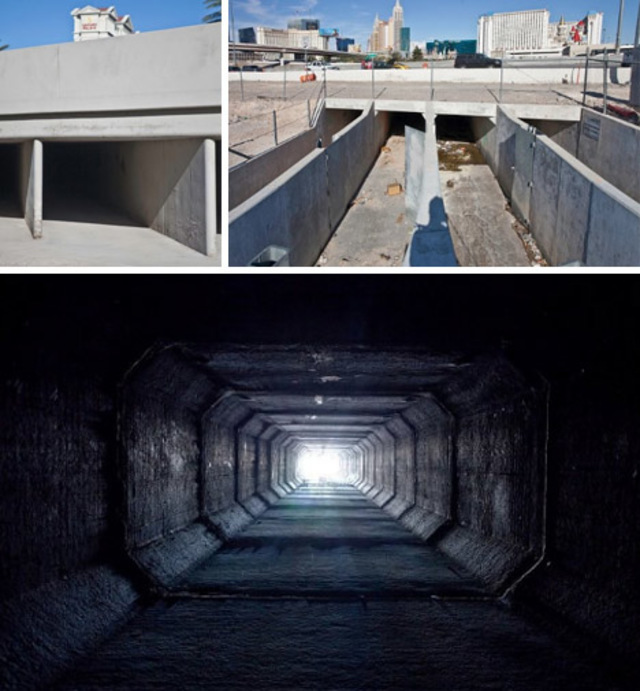 Anyone who has visited Las Vegas and taken the monorail has seen the incredible parking structures required to accommodate travelers – just imagine those same huge stacks of unused space laid out beneath the grid of the city, so many dark subterranean corners ready to be turned into ersatz dwellings. 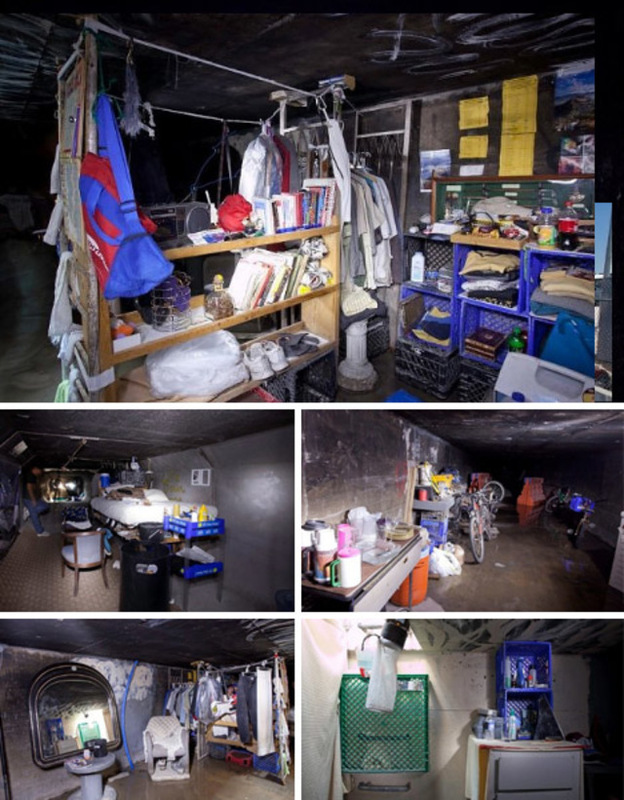 Some of these places have been turned into virtual homes, complete with running water (for DIY showers and sinks), furnished living rooms and real (salvaged) beds with mattresses and blankets – most likely leftovers from the hotels above. A city of abundant means, Las Vegas celebrates opulence and waste from the tourist-oriented service industries abounds (from trashed food to furniture objects). As such, it is in some ways an easy place to live homeless – or in a relatively comfortable, cool and semi-safe underground squat. Between begging and swiping forgotten winnings left behind by drunks, there is also cold cash and hard credit to be had. Some denizens cobble together impressive collections of objects and elaborately decorate their dwelling spaces.